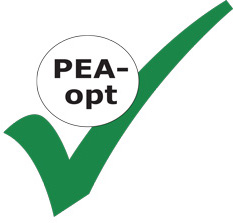 PEA-opt® is a quality mark used exclusively for products that contain optimized palmitoylethanolamide (PEA). Optimized palmitoylethanolamide is natural PEA prepared by means of a modern patent for formulation. That’s why the PEA particles have a special quality, fineness and are finely distributed, enabling this product to optimally support the intake process in the body. This contributes to its effectiveness. There are many variants of palmitoylethanolamide preparations on the market. The choice for a preparation with the PEA-opt® quality mark is a correct decision. If PEA is prepared according to a specially patented process (known as ‘patented PEA formulation’). Because these are patented PEA formulations that - under the supervision of doctors - are clinically tested for effectiveness and safety. Each PEA preparation that has obtained the quality mark PEA-opt® has particles that are finely distributed. Each PEA capsule with the PEA-opt® quality mark is prepared according to a patented preparation process so that practically no agglomoration can occur in the highly fine particles of PEA. This unique process was developed by the Russell Science Group and has led to a PEA preparation that’s unique in its composition. Each PEA capsule with the PEA-opt® quality mark is produced by means of a patented method so that it is never necessary to add any chemical or pharmaceutical excipients. This means that your body is not burdened by unnatural and foreign substances. 5. An analysis certificate is available. With the publication of an analysis certificate on the website, you can see the purity of the preparation for yourself. The analysis certificate comes from an independent American research laboratory that determines the purity of supplements and medicine. This analysis is carried out using the most modern methods and according to the highest standards of Good Laboratory Practice (GLP). All preparations that carry the PEA-opt® quality mark contain PEA with the highest level of purity. This is vital because there are various PEA preparations on the market and in some products the level of purity is obscure or low. The preparations with the PEA-opt® quality mark contain absolutely NO chemical or pharmaceutical excipients (such as magnesium stearate, povidone, sorbitol) or colouring agents (such as titanium dioxide). After all, modern and conscientious consumers do not want any mixes that contain redundant chemical substances or colouring agents, certainly if there are indications that these substances are harmful to our health.